We are excited to announce that the new restaurant in Epcot's Morocco Pavilion is opening tomorrow! Details of the plan for this location were released back in 2012, so we have been eagerly anticipating it's debut for quite some time now. In particular, many Disney fans have been especially excited for the additional opportunity for Illuminations-viewing at a table-service location on the World Showcase lagoon. If you are unfamiliar with IllumiNations: Reflections of Earth, allow me to explain! This is the evening spectacular that takes place nightly in Epcot's World Showcase. It is a breathtaking show featuring lights and fireworks set to a moving musical score. There were previously only two locations in which to dine al fresco and watch the show at the same time, the Rose & Crown Pub in the United Kingdom Pavilion and La Cantina de San Angel, but now the World Showcase has a third option! Fans of the existing Moroccan restaurant, "Marrakesh" will certainly want to give this new location a whirl. The restaurant features traditional Mediterranean fare and features tapas, or "small plates". So it is not strictly Moroccan cuisine. Take a look at the menu (click on it for a better view) And here are some pictures of the tables along the World Showcase Lagoon: Looks pretty interesting! Personally I can't wait to check this location out on my upcoming trip this Spring. 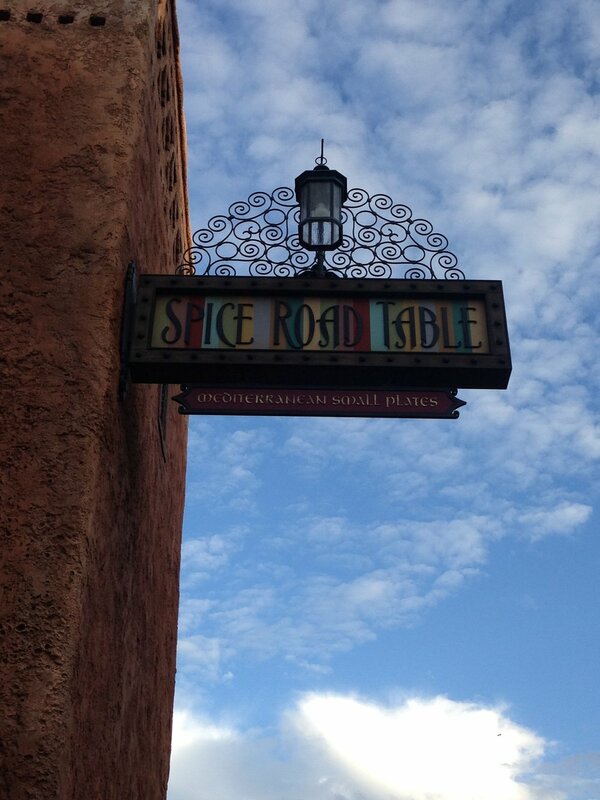 If you have the chance to eat at Spice Road Table please leave a comment below as to what your thoughts are and what you recommend from the menu!